Sample of leave application during examination in school and you need to appear in next school examination. Leave Application for missing exam in school, college or university. With due respect it is stated that my family had a serious accident last week and I would like to inform that my sister couldn’t survived the injuries and has passed away last night, it’s a very hard time for my family, they are suffering from mental trauma and they need me there. I am aware that my exams are starting from Monday and I will not be able to attempt my papers. I want leave from 6th June to 16th June as I have to be busy in the funeral services of my sister. I take full responsibility not attempting my exams. I am ready to take re exams as soon as I will be back. I shall be really thankful for this act of kindness. Thanks. 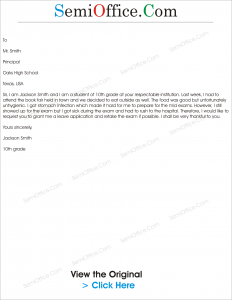 Sir, I am Jackson Smith and I am a student of 10th grade at your respectable institution. Last week, I had to attend the book fair held in town and we decided to eat outside as well. The food was good but unfortunately unhygienic. I got stomach infection which made it hard for me to prepare for the mid exams. However, I still showed up for the exam but I got sick during the exam and had to rush to the hospital. Therefore, I would like to request you to grant me a leave application and retake the exam if possible. I shall be very thankful to you. With due respect, I beg to say that I met a serious accident yesterday on my way back to home. I have got my right arm and leg fractured and I am not able to move from my bed. I request you to grant leaves and allow me a retake of my last exam which held today. I am being advised a complete one month bed rest by the doctor. Please find attached my medical report and medical certificate. I shall be really thankful to you for this act of kindness.